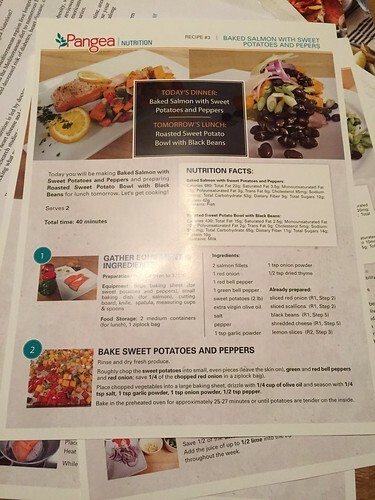 They send the recipe cards separately in the mail, so be sure to check for those around the same time. Pangea Nutrition costs $150 per week for two people, and it includes three dinners and three lunches plus some snacks per person. It comes out to $12.50 per meal per person, plus you get the snacks and the portions are generous. I also think with the current setup you get more than just the meals. 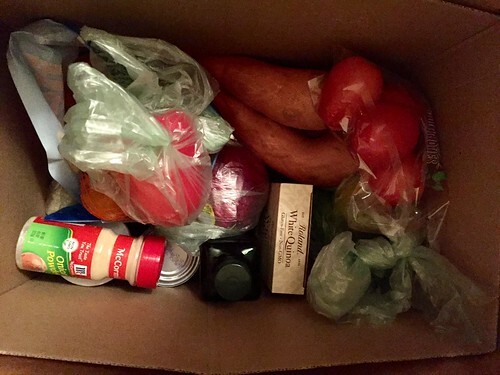 While other meal kit services assume you have olive oil, salt, and pepper at home, I actually received all these with the delivery from Pangea. 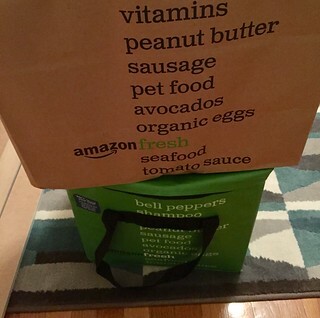 Since they use Amazon Fresh, that meant I got a big bottle of olive oil, a whole can of salt, etc. Since one of the recipes call for oranges, I also got a whole bag of cutie tangerines, which were way more than needed for the recipe. They were great healthy snacks, though! What I also like about Pangea nutrition is that during your dinner prep time, they have you prep your salads for lunch the next day as well. From the kit that I got, there's always salad for lunch the next day and they're prepared using overlapping ingredients, which makes it easier to prepare all the meal during the work week and reduces waste. The meals were definitely healthy, but pretty delicious and simple/easy to make. 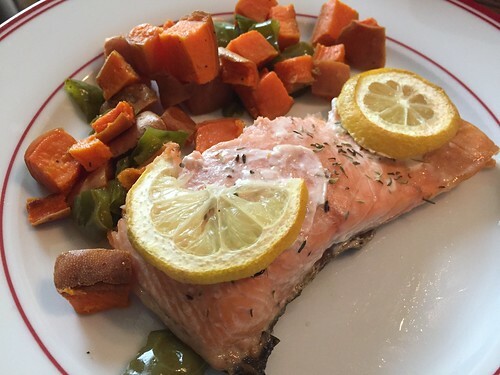 Among my three dinners, there was a chicken fajita dish, a poached salmon with quinoa, and a roasted salmon with sweet potatoes and bell peppers. 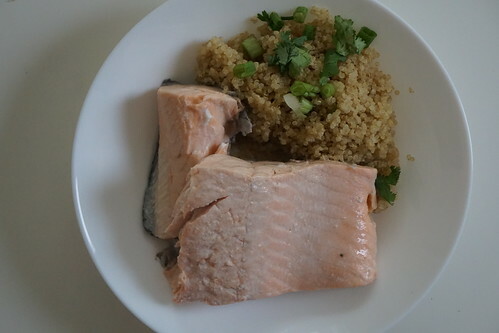 The protein portions that I received were quite generous and actually enough for 3 meals instead of 2, and they were quick to prepare, even while preparing the salad lunch for the next day. 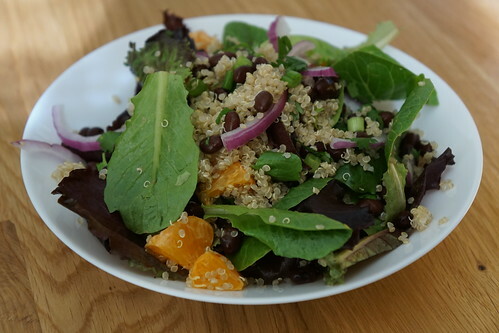 As I mentioned, they use overlapping ingredients so if you follow the order they suggest to do the recipes, you can use the same black beans for subsequent recipes, and so on, saving you time throughout the week. Want to try Pangea Nutrition? You can use the code MODMED17 to get 60% off your order. This code is good through October 2017. Preheat the oven to 400°F. Cut potatoes into bite sized pieces and toss with 2 tablespoons of extra virgin olive oil and 1/4 tsp of salt. Place in medium baking dish and into the oven for 35-40 minutes (Optional: stir every 5-10 minutes). For the Pangea bravas sauce: mix together 1/2 cup Greek yogurt, 1 tablespoon extra-virgin olive oil, 1 tablespoon water, 1 tsp paprika, 1 minced garlic clove and 1 tsp sherry vinegar. Serve drizzled on cooked potatoes alongside poached cod. Enjoy!